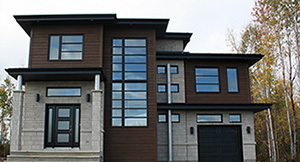 Fortex siding is made in Canada for AFA Forest Products, one of the largest wholesalers of building materials. In business since 1974 AFA's clientele consists mainly of home centers. The company has 12 branches in Canada. With hundreds of dealers across Canada, it's easy to find Fortex siding products. With Fortex, your construction or renovation will peak quality, aesthetics and durability.